The festive season has always been a popular time to release compilations and the quality of the games on offer this Christmas has been exceptionally high. 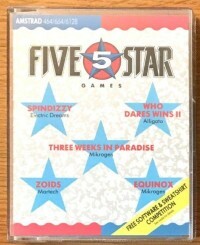 One such package is Beau Jolly's Five-Star Games featuring five hits form 1986 including the fantastic Spindizzy. 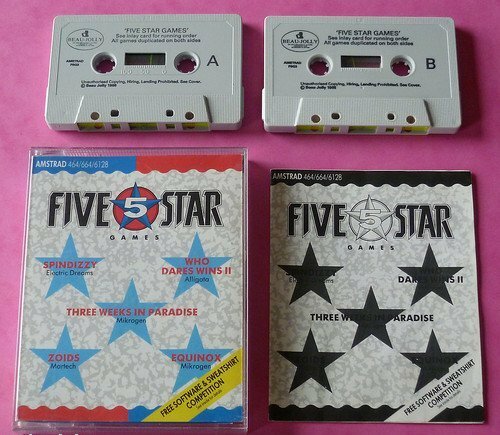 For once, the twin cassette box actually contains TWO tapes. The games are arranged as follows: Tape A has Spindizzy (Electric Dreams), Three Weeks in Paradise (Mikrogen) and Who Dares Win II(Aligata). Tape B comprises Zoids (Martech) and Equinox (Mikrogen). The Red Zoids, enemies of the Blues, have captured Blue leader Zoidzilla, and broken him into six pieces which now lie scattered about the planets surface. Your mission is to find all six pieces of your leader so that he can be reconstructed. Then, by merging minds with Zoidzilla, go off to give the Red Zoids a taste of their own medicine. Full marks to Martech for designing each version of Zoids to the strengths of the host machine, altering the gameplay where necessary and. although the Amstrad is sadly unable to support the Hubbard soundtrack used in the C64 version (arguably the best music yet for a computer game). Amstrad Zoids is an excellent game requiring a high degree of strategic thought and planning combined with a nifty trigger finger. Not a game that can be mastered in one sitting. Three weeks in Paradise finds our hero, Wally, lost in the jungle. Wilma and Herbert are about to be the main course at a Can Nibbles banquet. Obviously, this is not a good state of affairs so you must help Wally locate and rescue his loved ones before its too late. Three Weeks is a "side-view" arcade adventure set against a well designed jungle backdrop rich in colour and variety. Finding Herbert and Wilma is easy but freeing them is far from simple. Three Weeks is a good jungle jaunt well up to the high standards Mikrogen have set in past. It is unlikely that Spindizzy escaped anybody's notice the first time round but just in case... here goes. IT was one of the first top class games written for the Amstrad and was also one of the earliest Marble Madness clones. However, it is an original game in its own right, even though it based on rolling a ball around a map. Spindizzy is a near perfect game! 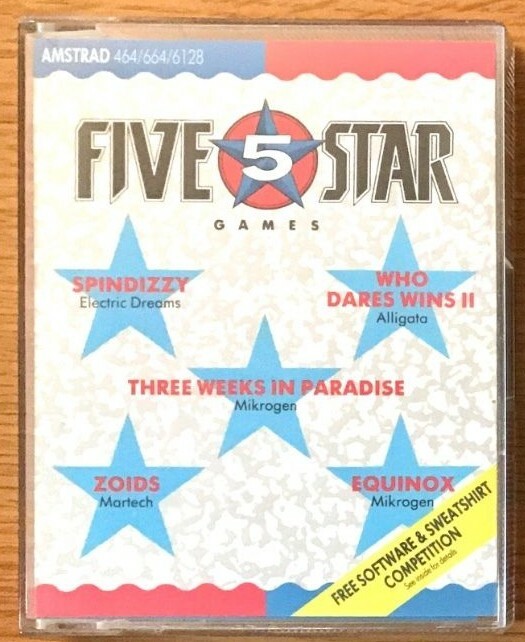 Equinox is the the second Milcro-Gen game on this compilation. The action takes place below the surface of asteroid Sury-Ani 7. A little disposal droid is engaged in a race against time. Equinox has playability in abundance. You'll need to be nimble-fingered to kill an annoyingly high number of assorted aliens, and nimble-minded to solve the increasingly complex problems put in your way. Who Dares Wins II is very much in the Commando/ Rambos style of game where all you have to do is destroy everything that moves and then go off the top of the screen and do the same and do the same again. The enemy comes at you with everything he's got including bazookas, tanks, machine gun posts, and planes that drop bombs and fire machine guns at you as they sweep past. Beau Jolly have put together a superb combination of games that should appeal to almost any gamer except die-hard adventurers.